I grew up in New England, an exciting place for a budding meteorologist. The weather is ever-changing with so many types of storms; hurricanes, tornadoes, and blizzards are all possibilities. The most representative of the region is, of course, the nor’easter. Nor’easters like The Blizzard of ’78 and the February 2013 Blizzard can be catastrophic. They can bring feet powerful storm surges that flood coastlines, high winds that knock out power, and feet of snow that trap people in their homes. You may remember from an earlier post, Did you know? The Nor’Easter Name, that the storms do not get their name because they occur in the northeastern US. The nor’easter name is a result of the strongest winds coming from the northeast. I figured since today is the beginning of meteorological winter, nor’easters were the perfect topic for tonight’s post. Nor’easters typically occur between December and March, but it is not that rare to see one as early as October or as late as May. Remember, Superstorm Sandy was a nor’easter that happened in October. A nor’easter does not need to bring snow, but it will always bring strong winds and heavy precipitation of some kind. 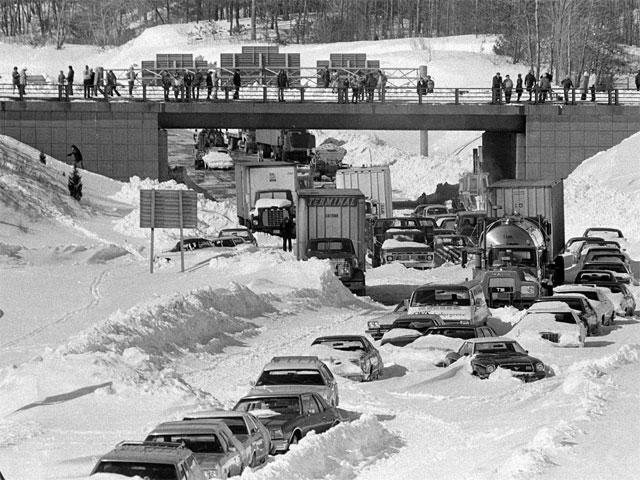 A few of the many, many cars left on Massachusetts highways during the blizzard of ’78. Nor’easters form from one of two ways. They are technically know as “Miller Type-A” and “Miller Type-B” storms but for now we’ll call them The Gulf of Mexico – Atlantic Ocean Path and The Coastal Re-development Path. There is a lot of atmospheric dynamics involved in these development processes, so this will be a bit of a simplification. I hope all of you can follow my MS Paint drawings. This is the more standard development process for a nor’easter. It begins with a low pressure system forming over the Gulf of Mexico. 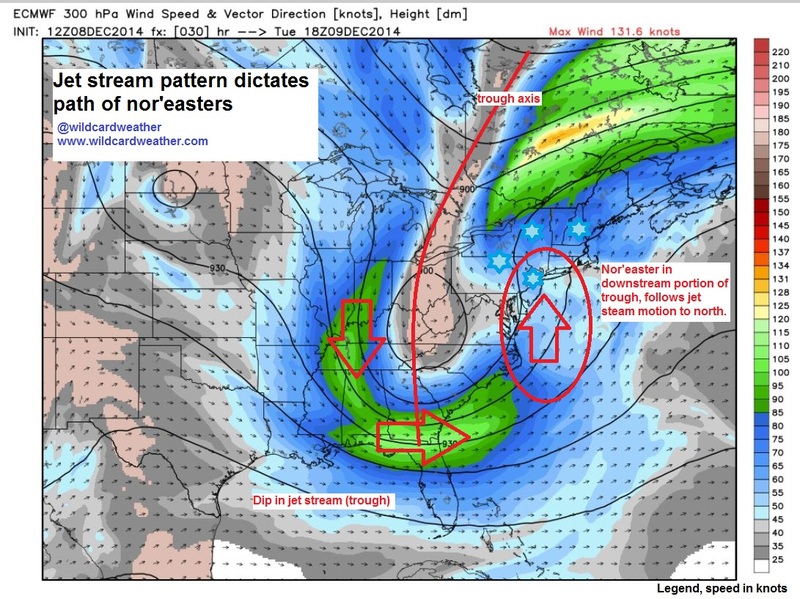 This may or may be related to a trough, or an area of low pressure associated with a southerly dip in the jet stream, over the Gulf. However it may appear, this system is rich with moisture. The low pressure system will move with the large-scale flow. For a nor’easters, this has to be to the northeast. The system moves over the southeastern United States, at this point dropping rain instead of snow. It is not very strong…yet. It is when it reaches the Gulf Stream off the coast of North Carolina that it really intensifies. The warm water turns to vapor and rises into the storm. This convection is giving the storm all of its energy. Of course there’s always another player involved. For nor’easters that is the Appalachian mountains and cold air damming. Cold air circulates clockwise around a high-pressure region in eastern Canada. It travels south and turns west into the eastern slopes of the Appalachians. The cold air is dense and takes up a shallow layer near the surface, a shallow layer than gets dammed up against the mountains. The damming does two things. First, it directs the cold air a lot further south on the east side of the mountains than on the west side. This can be seen on temperature and height plots of the region and increases the chances a nor’easter will deliver sleet or snow. Second, the dome of cold air causes the warmer air from the growing storm to rise over it, stimulating precipitation. Depending on the time of year and temperatures inside the cold dome, this can bring snow as far south as the Carolinas. With plenty of moisture and cold air in place, the nor’easter works its way up the coast, following the steering of upper level winds. The storm will typically continue to strengthen until its travels well over land or far from its warm-water energy source. This can be over northern New England, the Canadian maritimes, or out into the North Atlantic. As for those famous northeasterly winds, the sharp temperature and pressure gradients between the storm’s center and the high pressure center creates really strong winds directed between the two centers, clockwise around the high and counter-clockwise around a low. This storm path starts with a autumn, winter, or spring storm moving across the Midwest. It is a typical synoptic, or large-scale, storm consisting of a low pressure center, warm and cold fronts, and plenty of precipitation. As the storm reaches the Appalachians the mountains erode the storm’s structure. As this is happening, a second low forms along the Atlantic seaboard, somewhere between New Jersey and North Carolina. As the second storm forms, the first one dies off. The reason for this relates to a transfer of rotational motion and is beyond the level of difficulty I like to keep here at Wildcard Weather. 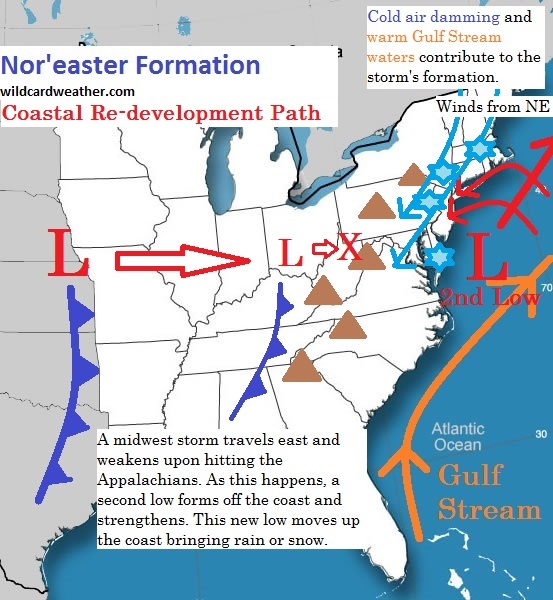 The short answer is that the nor’easter gets its energy from a previous Midwest storm and is further aided by the warm Gulf Stream water and cold air damming. The northeasterly winds are the same as for the Gulf-Atlantic path. 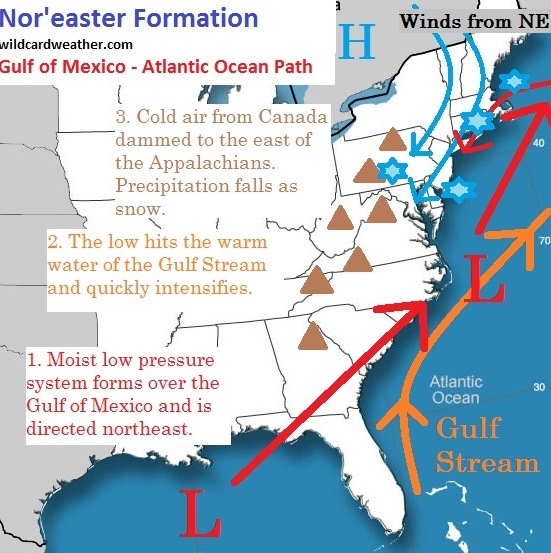 Updated 12/8/2014: Nor’easters, like many large storms, move northward because they are on the downstream side of large troughs, or dips in the jet stream. Here is another wonderful image. From an ECMWF model run for a nor’easter that will hit the northeast tomorrow, December 9th, 2014. The arrows are the direction of jet stream winds around the trough. The storm will be centered somewhere inside the oval. Last week’s Nor’Easter, What type what is? On November 26, 2014, the day before Thanksgiving, a nor’easter moved up the East coast and brought snow from the Washington D.C. area up to Maine. Temperatures were too warm to bring much snow along the immediate coast, but millions saw snow and thousands lost power. Look at the follow surface charts from the days around the storm. Which nor’easter type was this? Don’t be fooled by that large Midwest storm over the Great Lakes on the 24th because this is an example of the Gulf of Mexico – Atlantic Ocean Path. On the 24th, you can see a trough axis, labeled by an orange dashed-line, over the Gulf of Mexico. On the 25th, a broad area of low pressure exists over the southeast, centered over western North Carolina. Some rain is falling on the Carolinas, Georgia, and Florida. On the 26th, the storm has hit the warm Gulf Stream waters and has deepened quickly. Rain has spread up and down the seaboard. It is on this day that the storm moves quickly up the coast, bringing rain and snow. On the 27th, Thanksgiving, the storm has already moved off the Maine coast. When a storm’s low pressure center (tropical storms not included) drops a significant amount in a 24-hours, it is referred to as “explosive cyclogenesis“, or “bombogenesis“. The storm in turn is known as a “bomb“. The exact about of millibars, or hectopascals as is used in the meteorological community, is determined by the latitude. The equation is (24 sin φ/ sin 60˚) and φ is latitude. For example. in Boston at 42.35 N the storm center would need to deepen by 18.67 mb over 24 hours. This does not happen often, but the warm waters of the Gulf Stream can create a lot of rising air at the center of a nor’easter and a decrease the surface pressure. The deeper a storm’s center pressure is, the greater the difference is between the center and the edge. This will lead to stronger winds. There is a lot here, so take some time to digest it. I’ll include some links below on some sources of information. E-mail me at wildcardweather@gmail.com with any questions. There’s also Twitter @wildcardweather. Hope this has piqued your curiosity. A post about Alberta Clippers might make a great follow-up.